The Orthodox Church in America (OCA) is an autocephalous Eastern Orthodox Church in North America. The OCA consists of more than 700 parishes, missions, communities, monasteries and institutions in the United States and Canada. In 2011, it had an estimated 84,900 members in the United States. The OCA began when eight Russian Orthodox monks established a mission in Alaska, then part of Russian America, in 1794. This became a diocese of the Russian Orthodox Church after the United States purchased Alaska from Russia in 1867. 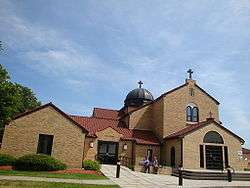 By the late 19th century, the Russian Orthodox Church had grown in other areas of the United States due to the arrival of immigrants from areas of Eastern and Central Europe, many of them formerly of the Eastern Catholic churches ("Greek Catholics"), and from the Middle East. These immigrants, regardless of nationality or ethnic background, were united under a single North American diocese of the Russian Orthodox Church. After the Bolshevik Revolution, Patriarch Tikhon of Moscow directed all Russian Orthodox churches outside of Russia to govern themselves autonomously. Orthodox churches in America became a self-governing Russian Orthodox Greek Catholic Church in America in 1924 under the leadership of Metropolitan Platon (Rozhdestvensky), popularly called the Metropolia. The Russian Orthodox Greek Catholic Church in America was granted autocephaly by the Russian Orthodox Church in 1970, and renamed the Orthodox Church in America. Its hierarchs are part of the Assembly of Canonical Orthodox Bishops of North and Central America. According to the April 1970 Tomos of Autocephaly granted by the Russian Orthodox Church, the official name of the Church is The Autocephalous Orthodox Church in America. The more comprehensive March 1970 Agreement of Tomos of Autocephaly, however, states in Article VIII that the legal name of the Church was changed to "Orthodox Church in America" (with no definite article). The volunteers, led by Archimandrite Joasaph (Bolotov), departed Saint Petersburg on December 21, 1793, and arrived at Kodiak Island on September 24, 1794. When they arrived they were shocked by the harsh treatment of the Kodiak natives at the hands of the Russian settlers and Baranov. They sent reports to Shelikhov detailing the abuse of the local population, but were ignored. In response, however, the Holy Synod created an auxiliary episcopal see in Alaska in 1796, and elected Fr. Joasaph as bishop. Fr. Joasaph and a small party returned to Russia in 1798 for his consecration, and to offer first-hand accounts of what they had seen. During their return voyage to the colony in May 1799, their ship sank and all aboard died. In 1800, Baranov placed the remaining monks under house arrest, and forbade them to have any further contact with the local population. In 1868, the first Orthodox church in the continental United States was established in San Francisco, California. Numerous parishes were established across the country throughout the rest of the 19th century. Although these parishes were typically multi-ethnic, most received support from the missionary diocese. In 1872 the diocesan see was relocated from Alaska to the city of San Francisco, California in the United States. The mission itself was instituted as a separate Diocese of Alaska and the Aleutian Islands on June 10, 1870, subsequent to the sale of Alaska to the United States in 1867. 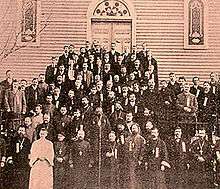 In November 1870, the first Orthodox church in New York City was consecrated. The first All-American Sobor was held March 5–7, 1907. Despite the conditions set out by Tikhon's decree for this temporary autonomy not being met, the American diocese of the Russian church declared self-governance in 1924, against the protests of the patriarchate, with which it had communication and which was capable of governance had its American branch been willing. The refusal of the American branch to submit to the patriarchate thus based itself officially on a document whose conditions it had not met. In reality, however, it was a fear of Communism and a belief that the patriarchate had been compromised which fueled the rebellion, paired with a desire on the part of the Metropolia to dissociate itself from the Russian Orthodox Church Outside Russia (ROCOR) of which it had been part. Although there were periodic attempts at reconciliation between the Metropolia and the Russian Church over the next few decades, no serious progress was made. During this time, the ethnic character of the Metropolia began to change. Since many Russian immigrants to America aligned themselves with the vocally anti-Communist ROCOR, the Metropolia experienced its growth increasingly through the addition of English-speaking converts. As a result, the ethnic makeup of the Metropolia began to shift away from a purely Slavic one that had included mainly Russians, Ukrainians, Galicians, and Rusyns. A 32-page report was released on September 3, 2008, that addressed the financial scandal and recommended "discipline" for five individuals including then-primate Metropolitan Herman, his predecessor Metropolitan Theodosius and two former treasurers as well as a former comptroller. The same report recommended then-primate Metropolitan Herman immediately resign or retire from his post or risk bring defrocked. Currently, the Russian, Bulgarian, Georgian, Polish, Serbian, and Czech and Slovak churches recognize the autocephaly of the OCA, though the Bulgarian, Russian, and Serbian patriarchates continue to maintain parishes inside the OCA's claimed jurisdiction. Among the churches that do not recognize it is the Ecumenical Patriarchate of Constantinople, which argues that the Russian Church did not have the authority to grant autocephaly, partly because the Russian Church at the time was considered to be heavily influenced by the Soviet government. The Ecumenical Patriarch also cites Canon 28 of the Council of Chalcedon, which asserted the jurisdiction of the bishop of Constantinople in dioceses located "among the barbarians" (i.e. outside the Roman Empire), is cited as the source of the Ecumenical Patriarchate's authority in the matter. For more details on this topic, see List of the dioceses of the Orthodox Church in America. The period between All-American Councils is set at three years, although this is not always the case. The first thirteen Councils (held from 1907–1970) are referred to as All-American Sobors, reflecting the American Church's jurisdictional ties to the Russian Orthodox Church. The fourteenth Sobor (held in 1970) is jointly known as the 1st All-American Council, reflecting the autocephalous status of the OCA. The most recent All-American Council (16th) was held in November 2012, at which time Metropolitan Tikhon (Mollard) was elected. ↑ The number of adherents given in the "Atlas of American Orthodox Christian Churches" is defined as "individual full members" with the addition of their children. It also includes an estimate of how many are not members but regularly participate in parish life. Regular attendees includes only those who regularly attend church and regularly participate in church life. 1 2 "Recognition of the OCA". Retrieved 2006-12-24. ↑ "Reporting On Orthodox Christianity". religionlink.com. Religion Link. Retrieved February 11, 2016. 1 2 3 4 5 6 Krindatch, A. (2011). Atlas of american orthodox christian churches. (p. 68). Brookline,MA: Holy Cross Orthodox Press. ↑ "The Tomos of Autocephaly". Retrieved January 27, 2015. ↑ "Article VIII – Name of Autocephalous Church". Retrieved January 27, 2015. ↑ "Comments of Bishop Tikhon (Fitzgerald)". Retrieved November 8, 2006. 1 2 3 "Biography of Bishop Joasaph (Bolotov)". Archived from the original on 2006-10-04. Retrieved 2006-12-15. ↑ "Biography of St. Innocent of Alaska". Archived from the original on 2006-10-04. Retrieved 2006-12-15. 1 2 "Biography of Bishop Paul (Popov)". Archived from the original on 2006-10-04. Retrieved 2006-12-15. 1 2 "Biography of St. Tikhon of Moscow". Archived from the original on 2006-10-27. Retrieved 2006-12-15. ↑ "Synopsis of the 1st All-American Sobor". Archived from the original on September 8, 2006. Retrieved 2006-12-15. ↑ "Synopsis of the third All-American Sobor". Archived from the original on September 8, 2006. Retrieved 2006-12-15. ↑ "Synopsis of the 4th All-American Sobor". Archived from the original on September 9, 2006. Retrieved 2006-12-15. 1 2 "Church History — The Twentieth Century 1900–1925". Archived from the original on 2006-11-10. Retrieved 2006-12-15. ↑ "Church History – The Twentieth Century 1925–1950". Archived from the original on 2006-12-08. Retrieved 2006-12-20. ↑ "Synopsis of the 6th All-American Sobor". Archived from the original on September 7, 2006. Retrieved 2006-12-17. ↑ "Synopsis of the 7th All-American Sobor". Archived from the original on September 4, 2006. Retrieved 2006-12-17. ↑ "Synopsis of the 13th All-American Sobor". Archived from the original on September 8, 2006. Retrieved 2006-12-17. ↑ "Synopsis of the 14th All-American Sobor / 1st All-American Council". Archived from the original on September 4, 2006. Retrieved 2006-12-17. ↑ Cooperman, Alan (February 26, 2006). "Accusations of Misused Money Roil Orthodox Church". The Washington Post. p. A09. Retrieved 2006-12-24. ↑ "Special Investigating Committee presents report to OCA Holy Synod and Metropolitan Council". Retrieved 2008-11-12. 1 2 Bishop Benjamin of San Francisco; et al. (2008-11-08). "Report of the Special Investigating Committee" (PDF). pp. 4, 31. Archived from the original (PDF) on February 25, 2009. Retrieved 2008-11-12. ↑ "OCA Holy Synod of Bishops grants retirement to His Beatitude, Metropolitan Herman". 2008-09-04. Retrieved 2008-11-12. ↑ "Bishop Jonah of Fort Worth Elected Metropolitan of All America and Canada". 2008-11-12. Retrieved 2009-06-02. ↑ "Statement from the Holy Synod Regarding the Resignation of Metropolitan Jonah". Orthodox Church in America. Holy Synod of the Orthodox Church in America, 16 July 2012. Web. 17 Jul 2012. <http://oca.org/PDF/NEWS/2012/2012-0716-holy-synod-statement.pdf>. ↑ Erickson, John H. "Chalcedon Canon 28: Yesterday and Today". St Vladimir's Orthodox Theological Seminary. Retrieved 2006-12-20. 1 2 Metropolitan Theodosius (Lazor). "The path to autocephaly and beyond: 'Miles to go before we sleep'". The Orthodox Church, Vol. 31. Retrieved 2006-12-20. ↑ "2006 Yearbook of Churches reflects 'robust immigrant history in U.S.". Retrieved 2006-12-19. ↑ "How many Eastern Orthodox are there in the USA?". Retrieved 2006-12-19. ↑ Dart, John (8 May 2002). "Who's counting? – Doing the numbers on membership". Christian Century. Archived from the original on 2006-11-17. Retrieved 2006-12-19. ↑ Ivanoff, Jonathan (30 August 2004). "Understanding Parish Revitalization" (PDF). Retrieved 2006-12-19. ↑ Krindatch, A. (2011). Atlas of american orthodox christian churches. (p. 70). Brookline,MA: Holy Cross Orthodox Press. ↑ "The Holy Synod". Retrieved November 4, 2014. ↑ "Statute of the OCA – Article IV – The Metropolitan". Retrieved November 4, 2014. ↑ "Statute of the OCA – Article VI – The Diocese". Retrieved November 4, 2014. ↑ "Statute of the OCA – Article III – The All-American Council". Retrieved November 4, 2014. ↑ "Metropolitan Council, Holy Synod to hold joint session". Retrieved December 19, 2006.